Laurie Goodman from Amherst Securities Group believes over 10 million more borrowers will go delinquent if the government doesn't take radical action. Millions more borrowers are going to default. Most of these defaults will be a direct result of the excessive debts they cannot handle. Some of these will be truly strategic, but most will be a stress-induced strategic default. The borrower probably could continue to struggle and make onerous payments, but they no longer see a point, so they will default. Are those strategic? Lenders would probably say so, but how much distress are borrowers supposed to endure? However you want to classify these defaults, they are coming. Until that debt is cleared out, the housing market will struggle, and so will our economy. Roughly 10.4 million mortgages, or one in five outstanding home loans in the U.S., will likely default if Congress refuses to implement new policy changes to prevent and sell more foreclosures, according to analyst Laurie Goodman from Amherst Securities Group. At the end of the second quarter, more than 2.7 million long-delinquent loans, others in foreclosure and REO properties sat in the shadow inventory, more than double what it was in the first quarter of 2010 (Click to expand the chart below). With the market averaging roughly 90,000 loan liquidations per month, it would take 32 months, nearly three years, to move through the overhang. And that number is contingent on no other loans going into default. Mainstream media reports on the months of shadow inventory miss this fact. The shadow inventory problem is not behind us. Borrowers are going delinquent in large numbers. It is better than it was before, but it is still bad. We are still adding loans to shadow inventory at a high rate, mostly due to strategic default. People know they can squat for a couple of years, so fewer are willing to struggle with their large underwater mortgages. “Many analysts looking at the housing problem mistakenly assume it is limited to loans that are currently non-performing (or 60-plus days past due). Such borrowers have a high probability of eventually losing their homes. However, the problem also includes loans with a compromised pay history; these are re-defaulting at a rapid rate,” Goodman told a Senate subcommittee Tuesday. Cure rates are abysmal, and they will continue to be. People can't afford the debt, and restructuring a super-sized debt to make it payment affordable does not solve the problem. That merely leaves debtors underwater and trapped in their homes. Under a reasonable estimate, which is calculated with more conservative market conditions than what is currently being experienced, Goodman found nearly 2 million re-performing mortgages would default again and another 3.6 million already troubled loans to default as well. The rest of the 10.4 million estimate is made of always-performing loans at various stages of negative equity. Of the 2.5 million always-performing mortgages with loan-to-value ratios above 120%, nearly half will default. Even 5% of the always-performing mortgages that have some equity left will default, as well, Goodman said. Most of those defaults will be strategic. Underwater loanowners who are paying more on their mortgage than the cost of a rental are truly throwing their money away. It's ironic that the same crowd who belittles renters as throwing their money away on rent have no problem with throwing twice as much money away on loan interest. Pretty stupid, really, particularly when they are obtaining no equity. In August, the Obama administration asked the housing industry for ideas on how to more efficiently sell or unload this overhang, and the Senate heard testimony from various housing players Tuesday. There are people that still deny shadow inventory is a problem. If it weren't why is the Obama administration seeking answers on how to deal with it? Each, including Goodman, said the government should target private investors. Robert Nielsen, chairman of the National Association of Homebuilders, said government programs should be revamped to assist small and local businesses in rehabbing and unloading these properties. Nielsen said Fannie, Freddie and the FHA should avoid bulk sales to large investors that have no stake in the neighborhoods in which these properties are located. “Local and small businesses that have a stake in the future of the affected communities should be the driving force behind the disposition of the REO inventory. This will result in the creation of jobs and the stabilization of neighborhoods,” Nielsen said. Bulk sales will be a bad idea. These funds will merely act as middlemen selling off individual homes to small investors and owner occupants. 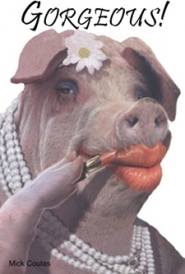 The profits made by bulk buyers is money the government could have acquired for itself if it merely continues with its current disposition efforts. NAHB also urged Congress to extend the current conforming loan limits for Fannie Mae, Freddie Mac and the FHA, which are due to be lowered on Oct. 1. Homebuilders want to sell homes to their FHA and GSE buyers at higher price points. Nearly half of their sales come from the FHA, and if those buyers can't obtain financing, the homebuilders cannot sell homes. Stan Humphries, chief economist for Zillow, said the rental market is currently booming and would be able to handle a mass conversion of foreclosures into rentals by investors, but the government, he said, would be wrong in upsetting this dynamic. Obviously, I agree with his assessment — and not just because I want to buy rentals. If the government starts renting instead of selling, this merely delays the necessary market clearing. These rentals would eventually need to be converted back to for-sale product unless Uncle Sam wants to become a permanent landlord on millions of single-family homes. When these properties are returned to the market, it will put renewed pressure on pricing and extend the housing crash. How long do we want to prolong the pain? Are we looking to see if we can duplicate what happened in Japan? But with a Congress currently gridlocked on nearly every issue, none of the panelists so clearly described the looming housing problem and the consequences of continued inaction like Goodman. “To solve the housing crisis you must create 4.1 million to 6.2 million units of housing demand over the next six years,” she said. So how do you create that much housing demand? Job creation would certainly help. Does anyone think the US will create that many jobs over the next six years? I doubt it. That only leaves one viable alternative. Let house prices crash until cashflow investors absorb them. The surest way to create housing demand is to lower prices enough to attract cashflow investors. Many markets are already at those price levels, and unless the government does something really stupid — like renting properties out instead of selling them — the low resale prices relative to rents will prompt buying by cashflow investors. If the government starts renting these properties out, it will depress rents and thereby reduce the demand for properties from investors. If investors stop demanding these properties, the supply will take much, much longer to clear. Owner occupants are not the answer. There are not enough wage earners with good credit to buy all the distressed properties. Cashflow investors must be part of the solution. 10% appreciation since October 2010? We're going to see many property profiles like this one over the next few years. The owner buys in the bear rally, watches the market crumbe around him, but he still puts it on the market at a price that will give him room to negotiate and pay the commissions. If this guy is going to sell this property, he is going to lose money. Prices are down year over year, and old Irvine condos are no exception. In fact, from what we have observed here, condo prices are still groping for a bottom. Anyone think he can get $575,000 for this property? This property is available for sale via the MLS. This gorgeous garden patio home is located in the highly desirable community of Orangetree in Irvine , just minutes away from John Wayne Airport, Newport Beach, Irvine Spectrum shopping center, Oak Creek Golf Course, Irvine Valley College and Fashion Island. A gorgeous Leaded insert front door opens into well lit living area with impressive vaulted ceilings and beautiful wood laminate floors. The large updated kitchen includes all stainless steal appliances surrounded by custom cherry wood cabinets and recessed lighting. 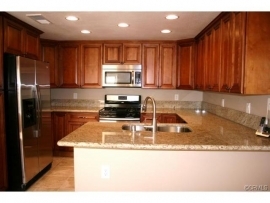 Both kitchen and bathrooms feature attractive and easy to clean granite counter tops with custom cherry wood cabinets. Three private bedrooms are carpeted in neutral colors. Home includes a fabulous landscaped patio with stamped concrete surrounded by a stunning custom redwood fence and gate. Enjoy the beautiful lush green belt located adjacent to the property for year around serenity. The property is extraordinary well maintained and includes an attached, oversized two car garage for extra storage. 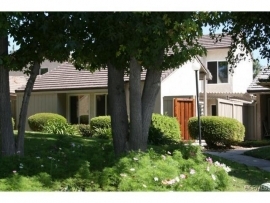 This home is located within minutes of Southern California's most desirable destinations and excellent Irvine schools. This entry was posted in Library, News on September 21, 2011 by IrvineRenter. I’m enjoying watching this bloodsport from the sidelines. Americans have figured out that the economy can’t just function by selling each other houses. Now they get to learn that they can’t just sell each other services. The “custom cherry wood cabinets” are apparently special enough to mention twice, but better yet are the three private bedrooms. Way better than those public bedrooms you get with less gorgeous and stunning houses. Irvine, a city of pretenders. Good riddance. In 10 years this city will look like little Bangalore/Shanghai/Seoul. When the population hits 500,000, we’ll see how high the API scores will be for the “public” schools in the city. It will take you half an hour to get from Irvine Blvd to Alton, and, it will take just as long to find a parking spot to shop at Ralphs. Irvine Blvd. and Alton actually intersect. There already is no 4th floor in Hoag Hospital, chinese consider the number “4” badluck. Irvine will *not* be dominated by ANY ethnicity other than the color GREEN. It’s amazing the FAIR treatment you get when you are green. Actually, if my memory serves me right, “8” is considered good luck and many houses are listed with 8’s in them to help the sale. There should be a few people in the real estate business around here to confirm that. Yes, even as a modern society superstitions still thrive. Yes, I see them listed at 689,888. The three 8 are magic to the Chinese types. The round eye people list their homes with the triple 8 to pray upon the superstitions of backward simple people. To me it’s all irrelevant anyway. I don’t hang out with the peasants north of the 405. They frighten me with their lack of disposable income. hah, I was so confused by this statement. The government shouldn’t do a darn thing. Housing is vastly inflated, and even though I’ll lose my 20% down and more, the prices should drop, and drop alot. Owning a home shouldn’t be tantamount to slavery. If wages are lowering (and they are), home prices should be lowering (but they aren’t in “upscale” neighborhoods). I look forward to the millions of defaults, and I’ll probably be one of them, but these prices need to fall so the next generations can have a home to raise families in. I expect the average SFR in Orange County to hit $200,000 in the next 10 years. When was the last time OC SFR prices were $200,000? This brings me back to the “normal” line where prices always increase because of inflation… why would they decrease? Those are like 1996 prices for a 3/2 SFR in Irvine… and if prices do get that low, that means either a nuke dropped or zombies are loose… which actually would mean houses are worth nothing. Well, notice he said a SFR in OC. That’s not just Irvine, he could say he meant Santana or Mission Pendejo. I’ve seen places in Fake Forest going for low $300’s, but I’m not super active watching prices. However, I do not think Irvine will drop that low…ever again. The older areas in Irvine tend have bigger lots. I think there are a few areas that do not have HOA fees at all. California Homes and Peppertree? Old Turtle Rock has always been my favorite part of Irvine, before all that nonsense that Newport Coast development brought about. I also expect home prices in OC to drop, but $200K is too low, IMHO. Especially with low interest rates. As it is, for a $200K home, your monthly nut is around $1,200, and that includes taxes, HOA fees, etc. If the average home buying family in OC is only able to afford $1,200 per month, we’d probably be in a depression, selling apples on the corner. If Irvine housing prices aren’t increasing at 25% a year it’s simply un-American. Why do you hate freedom? What if the government lowers the depreciation time to 10 years on rentals? This would attact investors to buy up inventory. I. R. Your fan base is not paying attention. I can’t beleive that at 3:00 I’m the first one to point out “stainless steal”! This house has everything that an OC realtor adores. Beautiful wood laminate floors (plywood with formica printed to look like wood, in little slats). And who doesn’t just despise those cheap hard to clean granite counters. Nope, only “easy to clean” granite for me. A stunning custom redwood fence and gate (apparently the original builder grade stuff melts in oh about 34 years or so). Also an oversized two car garage, ( Are cars bigger in the OC?) I’m not sure, but I think that neutral colors and stamped concrete are the rarest of features, that make this proper truly unique. I was walking through my neighborhood with my brother in law who is remodling the family home. I specifically pointed out what I think is the most glaring and needless “luxury” add-on, leaded glass front doors. This place truly has it all. I clicked by the local news here in Los Angeles yesterday (NBC, 5pm) and guess what the story headline was, complete with graphic? …who interviewed some guy on a couch in his apartment who thought that “now was a good time to buy”. I didn’t stick around for more. Were these people sick the day they taught journalism in Journalism School?